Visitors may browse our web site without revealing any personally identifiable information, but shoppers must open an account with us. At that time, you will be asked to provide such personally identifiable information as your name, E-mail address, home or business address, phone number. Credit Card Information (name, number, card type, expiration date and CID code). We DON’T collect your Credit Card Information. All the transactions done at complexcityspa.com are processed securely by PAYPAL. The information we learn from customers helps us to personalize and continually improve your user experience at complexcityspa.com. Your personal information is used for our internal business purposes only. complexcityspa.com does not sell, rent or lease your personal information to independent third parties. We may also use personal information to provide you with optional product or service updates, promotional notices and offers and other information about complexcityspa.com and its products. We use a newsletter system to provide our customers service updates, promotional notices and offers. You can unsubscribe from our newsletter anytime, each newsletter have in the footer area a unsubscribe bottom. Products can only be refunded if unused and in its original packaging. We will gladly refund or exchange unused products, if you return the product with receipt within seven (7) days of purchase. Refunds can only be processed with receipt. For online order returns, shipping charges will not be refunded. It is your responsibility to pay and arrange for shipping the product back to us if you are returning an online purchase. Gift Card orders are not exchangeable and non refundable. Your use of this site indicates your acceptance of these Policies and Terms of Service as well as your agreement to follow and be bound by them. Do not use the site if you do not agree to be bound by these Policies and Terms of Service. We may periodically change the terms and conditions, without notice. It is the consumer’s responsibility to check them from time to time. By making use of this website, you, the consumer, acknowledge that you have read, understood and agreed to be bound by these terms and conditions. In order to purchase from our shop you will be required to complete our registration process. As part of the registration process, you will be asked to choose a password. Please keep this password secret, as it is entirely your responsibility to maintain its confidentiality, and we will not in any way be held accountable for any unlawful use of your profile. You are also responsible for all transactions that occur under your user name and password. The consumer will be provided with a tax invoice, All prices exclude delivery costs. Products on this site will be delivered only within the United States. We aim to process and send orders as quickly as possible after they are completed. Orders will usually take between 5 and 10 working days to reach you, although we will do our best to deliver your order sooner. If you are not 100% satisfied with your purchase (because the items are unsafe, defective or of an unfit quality), we will happily refund your purchase. This right is enforceable for a period of ten working days, calculated from the date of the delivery of the items to the consumer. In this case, ComplexCity Spa will carry the costs of the couriers. ComplexCity Spa will also allow exchanges for the same monetary value in these cases. Gift cards are non-refundable once purchased on the site. They must be utilized within one year of date of purchase; thereafter they will become null and void. Please arrive at time for salon services. Services will begin and end on time as a courtesy to the next guest. You are invited to call us prior to your appointment for any questions you may have. We have reserved time and space especially for you and require 12 hours notices for all our appointments. If less than the required notice is given, we reserve the right to charge 50% for the full scheduled service. If for any reason ComplexCity Spa needs to reschedule or cancel an appointment, as much advance notice as possible will be given. We are constantly expanding our services to bring you the latest and greatest. Although we make every effort to keep our website menu updated, please note that prices and services are subject to change at any time. ComplexCity Spa accepts Visa, Master Card, Discover, American Express, bank debit cards, cash. we do not accept checks. You can pay easily through PayPal. 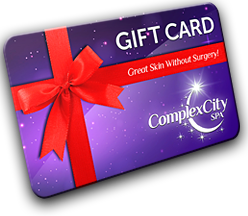 ComplexCity Spa gift cards are not redeemable if reported as lost or stolen. Donation certificates are non-transferable. All service sales and gift card sales are final. Retail items can only be refunded if unused, in its original packaging, and presented with a receipt within 14 days of purchase. In some situations, a restocking fee will be charged. Please notify ComplexCity Spa, if you have high blood pressure, special physical concerns, diabetes, or are pregnant.